The makers of Kabir Khan directorial ’83 have begun prepping up the cast to polish their cricket playing skills under the supervision of Kapil Dev and as the team, comprising of actors Ranveer Singh, R Badree, Harrdy Sandhu, Chirag Patil, Saqib Saleem, Pankaj Tripathi, Tahir Bhasin, Ammy Virk and Saahil Khattar, learn the ropes of the game better, the Internet is flooded with latest updates straight from the Bootcamp in Dharamshala. Adding to the curiosity of the fans, Ranveer uploaded a boomerang recently which features a grey-haired man. 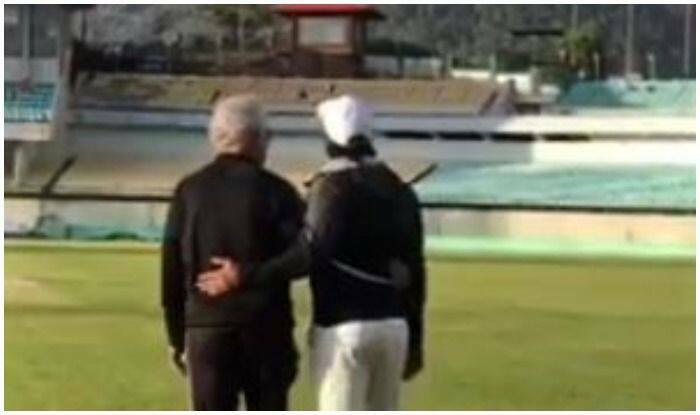 Keeping his identity hidden, Ranveer is seen walking on the pitch, twinning in all black with the man, against the backdrop of serene mountain range of Himachal. Not letting anything slip, Ranveer captioned the post as, “Guess who” (sic). While we can’t help guessing that it is stellar actor Naseeruddin Shah, the post is flooded with guesses and the 4-hour old post has already garnered over 3 lakh likes. Ranveer is playing the role of legendary Indian skipper who led the cricket team in the 1983 world cup tournament. For the same, he is learning all the tactics of the game and paying attention to Kapil’s style of cricket. Ranveer is currently learning the famous ‘Natraj shot’ of Kapil Dev and his previous Instagram post is proof of the same. Directed by Kabir Khan, ’83 is the story of India’s first cricket world cup win. The film has Ranveer playing the lead role while actors Ammy Virk, Hardy Sandhu, Pankaj Tripathi, Saqib Saleem, Tahir Raj Bhasin and Chirag Patil play the roles of other cricketers. The film is slated to hit the screens on April 10, 2020.